Description "The Valley of the Olives," is the largest surviving fragment of Inness' monumental painting "The New Jerusalem." It was renamed after the artist re-worked the canvas following a serious accident that occurred in Madison Square Garden on April 20, 1880. The original large painting had been lent to an exhibition in the newly built entertainment center, only to be damaged severely when a wall and tower fell in on the gallery killing three people. Recent scholarship has shown that the original painting, thought to have been lost for over 120 years, appears to have been divided by the artist into smaller pieces, which he repaired and repainted removing the religious references. The Walters also owns a smaller fragement titled "Visionary Landscape" (see WAM 27.2775). The Walters' American Collection. The Walters Art Museum, Baltimore. 2005-2006. Jerusalem Saved! 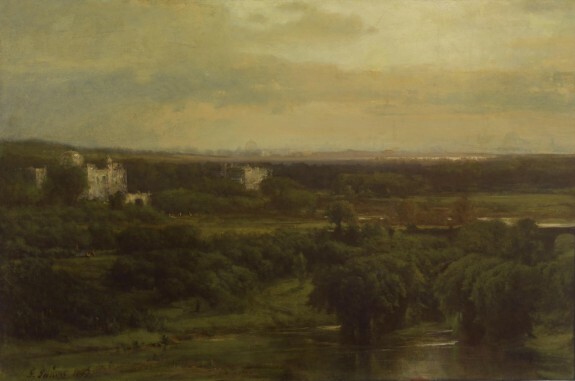 Inness and the Spiritual Landscape. Krannert Art Museum, Champaign. 2011-2012. Provenance Richard H. Halsted; Richard H. Halsted Sale, New York January 9 1895, no. 7; purchased by Henry Walters (through W. M. Laffan as agent), Baltimore, 1895; by bequest to Walters Art Museum, 1931.